One of our local Nashville restaurants serves a coconut-crusted chicken that is hugely popular, and for good reason: it’s delicious. So, when I was looking for something new to do with chicken breasts for dinner recently, I decided to use that coconut chicken as inspiration, and make a version of my own at home. I found a recipe that looked somewhat similar to our restaurant’s chicken, made a few small changes, and voila! Amazing coconut chicken that is perfect for weeknight meals, ready in less than 30 minutes from start to finish. And most importantly, it is scrumptious. 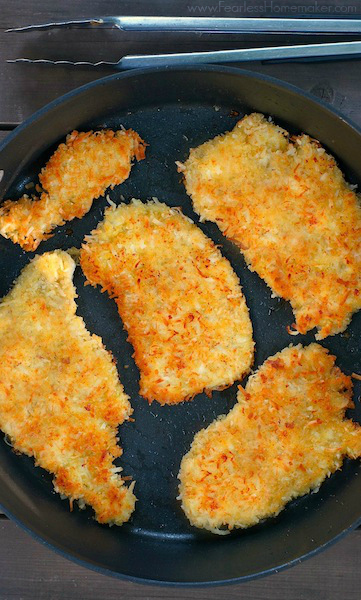 The coconut/panko crust is wonderfully crunchy and crispy, and provides an intriguing sweetness that works really well with the tender, savory chicken inside. The original recipe served these like an appetizer, cut in small strips and served with a dipping sauce, but I wanted it to feel more entree-ish, so I kept the chicken breasts whole, omitted the dipping sauce, and served it with rice and a fresh green salad. The secret to the awesomeness of this chicken lies in the flash-frying it gets before being baked in the oven — that gives it that wonderfully crunchy, perfect crust. And this is a recipe where I encourage you to be generous with the salt. The crispy coconut crust is quite sweet, and a good pinch of kosher salt over the chicken when it comes out of the oven provides a delightful sweet/salty balance. Using a meat mallet, pound chicken breasts between sheets of plastic wrap to 1/4- to 1/2-inch thickness. Preheat the oven to 400 degrees F. Line a large baking sheet with parchment paper or a silicone baking mat. Set aside. In a medium bowl, mix the coconut and the panko. In another medium bowl, mix the flour, salt, and pepper. In a third medium bowl, whisk the eggs together. Coat each piece of chicken in flour, shaking off any excess. Then, dip in egg and let any excess drip off. Then generously roll in the coconut/panko mixture, pressing to adhere, and shaking off any excess. Heat the coconut oil (or vegetable oil) over medium-high heat in a large skillet. Working in batches (if needed, so as not to crowd your pan), fry chicken for 2-3 minutes per side, until it’s just turning golden brown. Once each chicken piece is nicely golden on both sides, transfer to the prepared baking sheet. Bake for 6-10 minutes, until chicken is completely baked through. This chicken looks delicious – I love the bit of tropical flavor for a summer chicken meal. This sounds delish and perfect for my picky eater. I have one child that eats anything and one that makes me wonder where I went wrong :/ I bet they would both love this! this sounds like so much goodness! i’ll have to try your version and the restaurant version! mmmm! This looks amazing, Amy! I love coconut-crusted anything. And ready in less than 30? Sign me up! Pinning! Can’t wait to try this! I love coconut shrimp, I think the chicken will be just as good. I hope you love it, Bevin! Looks so good and crispy! Even better that is is ready in under 30 minutes! Sounds great, Amy. I love panko coated chicken, and this recipe takes it up a notch! Coconut would be great added into the mix. I’m a big fan of chicken, girl and I’ve never tried it with coconut. Yum, yum! Oh YUM, Amy this looks fantastic! I’ve been dying to try out coconut crusted anything but my husband won’t eat coconut… I’m just going to have to make this for myself! 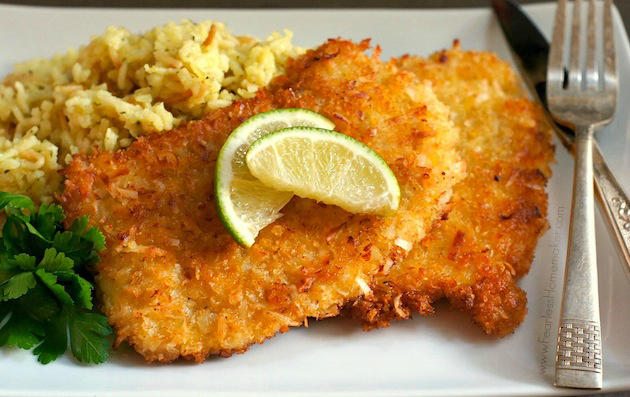 I love coconut crusted chicken! I now wish I had this for dinner. Mmmm looks delicious, thanks for posting the link on your Insta! I will make this for Sunday dinner with rice pilaf and a Greek salad. Awesome, Anna! Report back how it turns out — we LOVE this one!